Working dog sports or protection dog sports have continued to grow in popularity with local clubs popping up just about everywhere. Schutzhund was the first working dog sport to make its way to the United States from Germany nearly four decades ago. It was the pinnacle of dog sports for many years and still remains very popular today. Since the arrival of Schutzhund, many other working dog sports have made their way from Europe and have grown immensely in popularity. These include French Ring, Belgian Ring and basically a combination of the two, Mondio Ring. 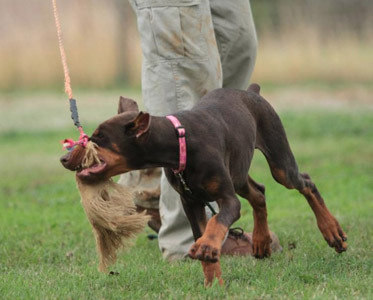 Regardless of what goal you have for your dog, personal protection or participating and maybe even competing in one of these sports, their foundation in grip work or bite development is all the same. Sierra Canine can start your dog with building confidence and drive, and then make all the progressions through each prey item to help you reach your ultimate goal. As previously stated, all of our programs are customized to your goals and budget. We can help you with anything from certain obedience exercises for these dog sports to starting a puppy and finishing them until they are on a sleeve or bite suit. This is a 15 week old German Shepherd out of Adlerhimmel German Shepherds. This is foundation protection training for a working dog sport. Here we are working on developing drive and a full grip. We are also desensitizing this puppy to different objects used in working dogs sports as stressors. Jager vom Drescher Haus is being trained for police service work, here he is only 12 weeks old. This video demonstrates the training steps of introducing environmental stressors, objects and obstacles that he could face in the future during police service work in apprehension of a suspect. This is Sierra Canine’s Rush at 11 weeks of age. This video demonstrates training to desensitize the pup to potential environmental stressors. One pool contains water, the other, a variety of empty plastic bottles filled with pebbles. You’ll also notice gun fire. This is Minka of Kreative Kennels at 14 months of age working on her IPO 1 Blind Search exercise. Owned by Jamie Kerr. This is Orion vom Kistha Haus(Rye) at 5 months of age. This video demonstrates foundation focused obedience using a marker based training system. There’s no correction at this stage of training.